Seamless steel gutters provide exceptional protection against roof damage, soil erosion, and basement flooding even during intense storms. Gutters that frequently clog or are damaged can lead to serious problems, including roof and foundation leaks. At ABC Seamless, we provide expert gutter installation services, including gutter guards, and specialize in installing seamless steel fascia-style gutters. These seamless steel gutters are incredibly durable and resilient and can carry 33 percent more water than more traditional gutter designs. 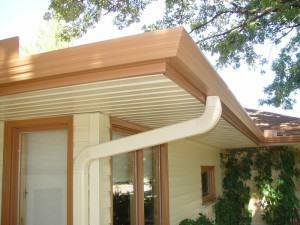 This lets them handle storms that would overwhelm the smaller gutter designs that most competitors offer. If you're interested in new gutters for your home, give us a call today at 1-208-939-4314 or click below to get started! We offer free estimates on all our gutter services in Eagle, Boise, Nampa and the surrounding areas. Materials: Most of our gutters are made from steel, specifically heavy 28-gauge, hot dipped, G-90 galvanized steel. This makes them incredibly durable and resistant to dents, dings, and other damage. Other popular gutter materials include copper, for historic homes, and aluminum, but neither can match steel for performance. Color: Our steel gutters are available in a wide range of different colors and can either be made to stand out from or blend in with the rest of your home. 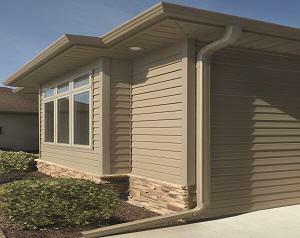 Style: There are several different types of gutter profiles. Our steel gutters are fascia-style meaning they designed to integrate with your home's soffit and fascia system which creates a cohesive appearance. Most other gutters are K-style or half-round which means they lack the same sense of exterior cohesion. Size: K-style gutters typically come in 5-inch and 6-inch sizes. Our fascia-style gutters are about 33 percent larger which lets them carry more water and even our downspouts are 4" x 3" which lets them handle double the capacity of the usual 2" x 3" downspouts. If you're interested in gutter replacement or gutter installation for your home, the experts at ABC Seamless are here to help. Our experienced professionals will help you determine the right gutter services and materials for your needs and provide you with a quality repair or installation. Call us today at 1-208-939-4314 or contact us online to get started on your gutter project. We offer free estimates on all our work in Eagle, Boise, Nampa, Caldwell, Meridian, Kuna, Mountain Home, Garden City, Ontario, Oxbox and throughout the surrounding areas.